UPDATE, JUNE 28: The Metro Board discussed the item at their meeting and asked staff to come back to the Board this fall with more options to consider. Metro has released a staff report and presentation that explains how the agency plans to operate the Crenshaw/LAX Line and the Green Line after the Crenshaw/LAX opens in fall 2019. First, some important background: As part of the Crenshaw/LAX Line project, the tracks for the new rail line were joined with the Green Line tracks just west of the Green Line’s Aviation Station. That gives Metro the opportunity to move trains between the two lines, meaning there are several options for running rail service in the future. Metro staff looked at a variety of operating scenarios and determined that two — see above — would provide the best service in terms of ridership, minimizing transfers, improving access to LAX, safely operating the new rail junction and offering frequent and consistent train service. Of those two, Metro staff say the optimal plan (alternative 1 above) would be to run one set of trains between the Green Line’s Norwalk Station and the Crenshaw/LAX Line’s Expo/Crenshaw Station. The other set of trains would run between the Green Line’s Redondo Beach Station and the new Century/Aviation Station being built as part of the Crenshaw/LAX Line. Century/Aviation Station would be the transfer point between the two lines. The Redondo Beach-to-Century/Aviation line would later extend north to the future Aviation/96th Station. This is station that will be the transfer point to the LAX Automated People Mover that will serve airport terminals. The station and people mover are forecast to open by 2023. (Metro is funding/building the station and Los Angeles World Airports is funding/building the people mover). Key statistic: about 75 percent of the Green Line’s ridership is between Aviation and Norwalk stations. This isn’t surprising. This segment includes Norwalk’s huge park-and-ride lot and transfers to popular north-south bus lines on Vermont Avenue, Hawthorne Boulevard and Crenshaw Boulevard, as well as the Silver Line and Blue Line. The big change, of course, will be for those who currently travel between Green Line stations west of the Crenshaw/LAX Line and stations to the east. Under the new operating plan, those riders would need to transfer at Century/Aviation to continue to the rest of the Green Line. The transfer itself would be easy — all trains will use the same platform at Century/Aviation. Metro plans to adjust the schedules of both lines so that transfers would take no more than three minutes during peak hours. Peak hour service on both lines would be every six minutes. The plan also lays out proposals to modify bus service in the area around the Crenshaw/LAX and Green Lines to reduce duplicative service and make transfers easier. As a result, Metro staff are proposing some changes to bus service. Metro will be holding public hearings for the bus service changes and will seek approvals by the appropriate Service Councils. One big change is that the G Shuttle between LAX and the Green Line will move to the new Century/Aviation Station after the Crenshaw/LAX Line opens — placing it closer to the airport. The plan is scheduled to be discussed in the Metro Board’s Operations Committee at 9 a.m. on Thursday. A link to the live webstream will appear here when the meeting begins. What do you think of the draft operating plan, riders and readers? Comment please. Why does the design capacity not permit shorter than 5 minute headway on the Crenshaw line? That seems like a design failure. While I don’t think the line will require shorter than 5 minute headways from the start, eventually it could need that and especially on game days at the Inglewood station. What is the cause of the 5 minute restriction? On the routing, I get that the majority of ridership on the Green Line is east of Aviation but that’s obviously going to be the case since there are double the number of stations. The real question is whether people on the East side of the Green line are going to commute West, only to hop on the Crenshaw line which then goes back East (in addition to North). Wouldn’t those riders just go north on the Blue line and then transfer to the Expo Line? Smart question. When Metro designs a rail line, it builds the line to accommodate the future projected ridership in the environmental documents. It’s hard to justify building in more capacity and still be cost efficient, especially for a growing and evolving system. As for the five minute headways, Metro is not currently running any light rail service that frequent — peak hour service is actually every six or seven minutes depending on the line. Three car trains every five minutes is, I think, a lot of capacity and pretty much as good as it will get on much of our light rail system. Thanks Steve. Is Richard’s comment accurate? That the 5 minute rule is related to LADOT, rather than anything technical? I don’t think it’s accurate to say there’s a “five-minute rule.” In this case, that’s what Crenshaw was designed to. I think it’s best to ask LADOT about their views on train frequencies but it’s very common for cities served by Metro Rail to offer opinions on impacts of street-level crossings. Thanks Steve, I guess I’m still confused. When you say 5 minutes is what “Crenshaw was designed to”, what exactly do you mean? How specifically is the Crenshaw design limited to 5 minute headways? LADOT considers anything faster than 5 minutes to be too frequent for a line that crosses at grade. So Metro has to plan operations for 5 minutes or longer on any line that crosses a street in LA. Does Metro have an estimated travel time for the Norwalk to Expo line route? It’s 26 minutes on the Green Line from Norwalk to Aviation/Century. The timetables for Crenshaw/LAX Line are not out yet (line doesn’t open until Fall 2019) but the environmental documents for the project estimate that it will probably be about 25 minutes from Expo/Crenshaw to Century/Aviation is about 25 minutes. 25 minutes to go 7.25 miles seems slow, especially since most of the route is in a dedicated ROW or grade separated. It really should be closer to 20 minutes or lower, especially for only 7 stops (unless it includes 96th street). I’m guessing the EIR expects extremely conservative speeds around curves as well as poor traffic light synchronization / priority on Crenshaw. Even so, that still seems long. The expo line from Downtown Santa Monica to La Cienega is about the same length, only about a quarter mile longer and that takes 20 minutes with an additional stop and the same length of street running. If this is the best this line can do, that’s pretty disappointing and does seem like a flaw in design. Actually the Final EIR says it’s about 18 mins from Aviation/Century to Expo Line. So assuming 26 min from Norwalk to Aviation/LAX + 2 mins to Aviation/Century, we’re looking at around 45 mins from Norwalk to Expo Line, which is actually pretty good. Ok yeah 18 minutes makes a lot more sense, that’s good. Steve – I think Andrew has a really good point regarding how many people on the east side of the Green Line would want to go up to the Expo Line given their other more direct north-south alternatives as the Blue and Silver Lines – and even the Metro Rapid 754 on Vermont Ave. The staff report also fails to consider the number of LAX airport workers and travelers who use the Green Line to reach their destination at LAX, and who have no need to travel further north to the Expo Line. This statistic should be easily quantifiable. By contrast, I live in the South Bay and lack any direct north-south way to travel by Metro to destinations like Downtown L.A. I currently take the Green Line to the Silver Line, but the transfer at the Harbor Freeway station is unpleasant, inconvenient and unpredictable. The proposed operational plan offers little, if any improvement by requiring not one, but two transfers – first at Aviation / Century and then again at Expo / Crenshaw. Metro promises 5 minute headways at peak hours at Century / Aviation and an easy transfer on the center platform. But what about at non-peak hours during the rest of the day? Evenings ? Weekends? And there no longer will be direct service between Redondo Beach and Norwalk. Using Century / Aviation as a transfer point between the two Green Line segments requires not only an additional transfer at Century / Aviation but also a 2.6 mile detour up to Century Blvd. and back again to Imperial Highway. About this, the staff report is silent. There is a huge, unmet need for north-south travel on the west side of the Los Angeles basin. Our alternatives are few. Existing roads and highways (San Diego Fwy, Vista del Mar / Culver Blvd., La Cienega Blvd.) are among the most congested in the entire U.S. Within the next decade, users on the east end of the Green Line will see new north-south alternatives in the West Santa Ana Branch Line and the Vermont Ave. BRT. But, for those of us on the west end of the Green Line, the Crenshaw / LAX line is the only game in town. Why diminish its luster to those of us along this direct north-south axis? Here’s the net effect of the proposed operational plan: People who live or work in the South Bay end up with a truncated short rail line, extending for a total of 5 stations. Requiring multiple transfers for destinations beyond Century / Aviation considerably diminishes its utility. We will remain in a transportation desert. I’m immensely disappointed with this myopic thinking about regional needs, including the South Bay, for a balanced and effective transportation system. Under the staff proposal, folks on the east side of the Green Line would just stay on westbound trains, which would turn north and go up the Crenshaw tracks to Expo. Riders on the Green Line from Redondo can do the same but that would require the transfer, which at peak hours should be relatively quick. The goal was to provide every six minute peak service on all branches of Green and Crenshaw combined. This plan accomplishes that, although folks going north of Crenshaw/Aviation from the Green Line’s four western stations will have a transfer. Thanks, Steve for getting back to me. But what are the transfer times between Green and Crenshaw at Century/Aviation during nonpeak hours ? About this, the staff report is silent. We have the best case scenarios for transfers at Century/Aviation during peak hours. What about the worst case scenario during an evening or over a weekend? And are there any operational advantages, particularly for headways during nonpeak hours, to trying to more closely equalize the two segments of Green and Crenshaw ? Seems this is the worst option on the table, necessitating multiple transfers for many groups of riders. Trains from Expo Crenshaw would go to Redondo Beach. On a round trip, everyone would need to transfer once when going through the WYE. Currently some round trips do not need to transfer while other need to transfer twice. Steve: Why not avoid transfers altogether? It might be possible to do a tri-directional Green Line as mentioned above, where trains on each segment of the line state their direction (e.g. from Norwalk the train would say “Green Line – Crenshaw/LAX” or “Green Line – Redondo Beach”). Rather than transferring at Century or 96th, riders need only to wait for the train going in their preferred direction. When I brought this up to a Metro Project Manager overseeing the Crenshaw/LAX extension, they cited the issue of having to split trains into different directions (and thus, reducing the overall peak train frequency in all directions). However, if there are two trains (from Norwalk; each one coming every 6 minutes for peak hours) being split so that one goes North and the other South, then each direction will also have two trains, as the train going North from Norwalk is met directly behind by a train going North from Redondo beach. Basically, no frequency is lost: trains are split in two directions from each origin, but since each origin splits trains, all directions get the exact same frequency of trains. The only issue would be the increased precision required when splitting the trains at the tri-way at Aviation Station, as to avoid any collisions. This might be a challenge for engineers but is entirely doable, and it gives all passengers the ability to go in any direction they like (without an additional transfer), all while maintaining the maximum peak frequency. Thoughts? My preference as a rider is to get on a train ASAP and not be standing around the station waiting for a particular train going to my destination. I’d rather be on a train and moving toward the downstream transfer, if one is needed. I do think staff considered a number of options and thought this one was the most workable. I do think that some riders from the westernmost Green Line stations may now head up the Crenshaw/LAX Line and over to Expo instead of riding the Green Line to the Blue Line or Silver Line. Something to chew on. You bring up a good point about the westernmost stations connecting via Expo to downtown. This brings up the question again of why Metro plans on shutting the Blue Line down for maintenance BEFORE the Crenshaw Line opens? Also, if option 1 is selected, the long planned nomenclature change might have to go into effect. Otherwise with #1, will the Green Line be from Norwalk to Expo and the “South Bay” Line from LAX to Redondo Beach? Capacity on Metrorail is only 12 trains a hour? That’s a train in one direction every 5 minutes. Penn Station in New York with a mix of mostly New Jersey Transit Commuter trains and some Amtrak trains run up to 24 trains an hour using one track in each direction on tracks in tunnels under the Hudson River.That’s 24 trains an hour in each direction at Penn Station which is over a 100 years old. Rail Transit agencies with fully grade separated rights of ways regularly operate with 90 second headways which is a train every 90 seconds. With modern automated signaling headways shorter than 90 seconds are possible. The Green Line is fully grade separated and the Crenshaw/LAX Line is mostly free of grade crossings. There are no grade crossing between 96 Street and the entire Green Line. At the very least LA Metro should be able to run as many trains, 24 trains per hour in each direction of Green and Crenshaw/LAX trains to Century Blvd Station by 2019. Penn Station in New York has been able to run that many trains since 1910. The problem is the flat WYE junction, where trains must cross over themselves. NJ transit doesnt have any such junctions heading into NYC. Inbound trains dont cross outbound train tracks very often. Chicago’s L has one(4 way instead of 3 way) and it also causes problems maintaining headways and with maintenance. There also arent any grade crossings that NJ transit/Amtrak dont have preemption over. So the trains never have to stop for cars. In LA though, LADOT wont give trains priority, so LAMetro has to run trains less frequently. The Red/Purple line is being upgraded to support 90 or 120 second operations. It has no flat WYE junctions and no grade crossings. Every time you look at the Flower Street segment, which currently has 3 minute headways during peak (40 trains an hour) you can see that it doesn’t work well with trains regularly stopping at red lights. It is just tough to coordinate, and at some point the Regional Connector subway will need to be extended because it is pedestrian unfriendly. The switch at Washington and Flower gets a workout and I can see the lessons learned there to minimize the daily use as much as possible. What kind of headways are these services going to see off-peak? If you’re used to a one-seat ride, waiting three minutes for a transfer probably isn’t that big a deal, but if they’re going to maintain 15-20 min headways midday and at night like the current Green Line, that can add 8-10 minutes of waiting for a transfer to your trip. If Metro would just maintain 10 minute frequencies or less all day than this wouldn’t be such a problem, I honestly don’t understand why they don’t do this. It would be a very easy way to help make up for the system’s other operation and design shortcomings. Transfers would be much less of a deterrent and time lost at street-running sections would be at least somewhat mitigated. Is there an estimated time of how much longer a commute would be for someone who would have to make a transfer at the Century/Aviation Station as they are traveling to, say, El Segundo Station at around 6:30-7am from Norwalk Station? Thank you. I don’t have that yet. But it is definitely going to add some time — probably a couple minutes between Green Line and Century/Aviation each way and transfer time, which will hopefully only be three minutes. We’ll have a better idea when trains are actually up and running on Crenshaw/LAX Line tracks and schedules are set. This operating plan creates a weird bent L shaped line. The Measure M plan does include a rail line along the Sepulveda corridor, Westwood to LAX, in the late 2040’s, so the dangling branch could be connected to something useful. Of course, that’s 25 years of a low ridership shuttle line from Redondo Beach or Torrance to LAX. I can’t imagine 6 minute service running for long along this route. With the high number of passengers for the Westside segment, and general comments at the community meetings, I’d be surprised if that segment isn’t HRT, which would give that sought after “one seat” ride from downtown to LAX. To compare the 25 minute travel time more, this route (Expo to Century) is actually a hair shorter than the orange line bus from North Hollywood to Balboa, and it has to stop at lights almost the whole way, but takes 23 minutes and has the same amount of stops. The gold line from Del Mar to Union station is about 9 miles and only takes 20 minutes, has the 3/4ths of a mile street-running section in highland park, has 8 stops, and many curves. Additionally, it takes the expo line trains, from 7th st. metro center to about La Cienega, about 25 minutes and that is with the slow flower st. section as well as from USC to Western. This just doesn’t make any sense. Heck, 15 minutes wouldn’t seem that crazy. If 25 minutes is the correct estimate than this will be Metro’s slowest LRT line that is mostly in a dedicated ROW. It is also not a good sign for other lines to come. I can’t believe Metro is favoring Alternative 1. Granted, they’re looking at serving the most riders, but from a regional outlook, it’s odd to say the least. Crenshaw operationally makes the most sense as a north-south line, while Green remains an east-west line. Leaving the South Bay with nothing but a stub line is a slap in the face to anyone living in the area. The above will become even more apparent once South Bay gets the Torrance extension and Crenshaw gets extended north. Maybe that’s Metro doesn’t see the operational benefits coming until those happen? Transfers especially during peak house for Green line passengers continuing both east and west as described in the plan is going to create problems for bicycle riders. While it’s relatively easy to board at each end of the line, trying to board at a transfer station when crowded creates issues for everyone and it’s actually illegal to board when crowded. To address this issue they really need a dedicated space for bicycles, more than what the trains currently provide. The new green line cars are even worse for bicycle riders as space has been reduced. The articulated space between cars is now too narrow to avoid blocking the aisle and the dedicated space for bikes, strollers, etc is quite a bit smaller. Whomever came up with the new car design wasn’t thinking bicycles and now that Metro charges for parking, it might move more commuters to bicycles. Not a very bike friendly plan. As someone who lives in Hollywood and works in El Segundo, I’d like Metro to take a look at a staggered approach. Currently, I take the 6:32a DASH to the Red Line to the Silver Line to the Green Line to the Douglas station for my commute. By having each Green Line train travel to the Century station, I’ll add at the very least a half hour. There aren’t any earlier DASH buses either. What if the Green Line ran a staggered lineup, where certain trains would run through to Redondo Beach while others would run up to the airport (or to Expo)? That way I could tell by the train display which one I’d be taking, similar to the Red/Purple line as it heads towards Vermont. When I voted yes on R and M I remember voting for a NORTH-SOUTH rail line to LAX so I expect that and not a crooked L (or V?) shaped Line. So yeah, by that I also expect the LAX line to continue SOUTH and not East. Go with Alternative 2, and once there is money to a Santa Monica Extension of the Green Line, we can talk about a northern extension. As a South Bay resident, I prefer Alternative 2. Alternative 1 will give us a little “stub” line that will always have lower ridership and eventually less service frequency. I experienced this before when living in San Jose and VTA tried a “stub” line. It doesn’t function well. Will Metro have community meetings and public hearings to solicit public input before selecting Alternative #1 or Alternative #2? I knew this would become an issue. I sent in suggestions and talked about this at every meeting.We were told Green would always one day get to LAX. In doing do, you force riders on the existing Green who want to go to Redondo Beach or eventually Torrance now to ride to Century station, change and double back to where they wan to go. -You need to go with what other Metro maps have shown in the past of Green -1 going to LAX and Green-2 going to Redondo/Torrance. Crenshaw needs to be from Expo to Redondo and eventually Torrance as a North South Line. Much of this could have been avoided when the original Aviation Station was built. You KNEW one day the line would get to LAX, why wasn’t the station set up to be a transfer station in itself with a north /south platform in addition to the east/west platform ? Second this opinion. You may recall Hawthorne was a transfer point when the Green line was down west of Hawthorne. Going eastbound all the shuttle bus traffic from west of Hawthorne and all the LAX traffic was dumped at that transfer point and it was overcrowded. You are reinventing the same issue and it will not be a good experience. How come you guys don’t ever feature updates on the Crenshaw Line anymore? There were regular updates on construction progress for Expo Line, but it’s like Crenshaw is being built in a vacuum. 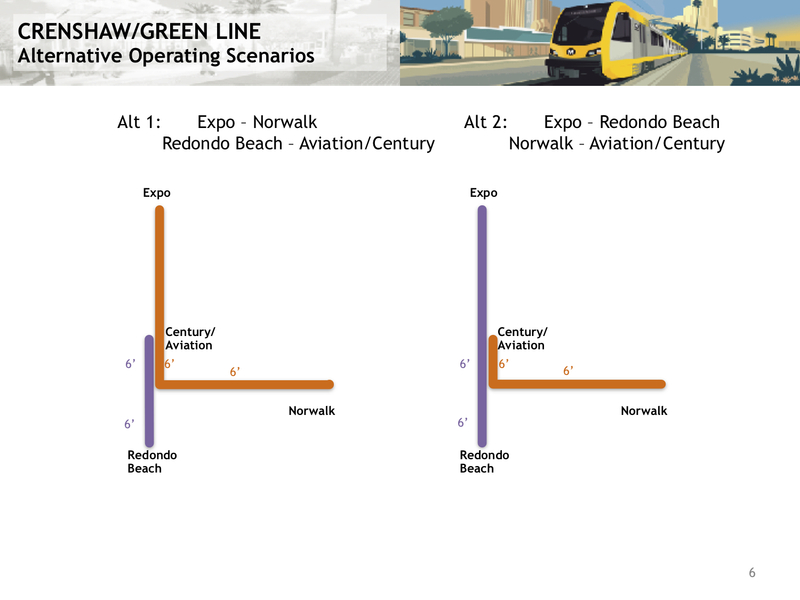 I think the better plan, at least for the morning and evening rush periods, would be two full lines – Green 1 between Norwalk and Expo/Crenshaw, and Green 2 between Redondo Beach and Expo/Crenshaw, without using the Aviation/Century Station as a terminal. Having both Green Line services would allow everyone coming from the Expo Line to travel to LAX (a major job center) in the quickest way possible and with frequent service (4-7 intervals to/from Expo/Crenshaw). I’m not crazy about having a third Green Line (current service between Norwalk and Redondo Beach), as having a new airport rail station makes that third rail line unnecessary.